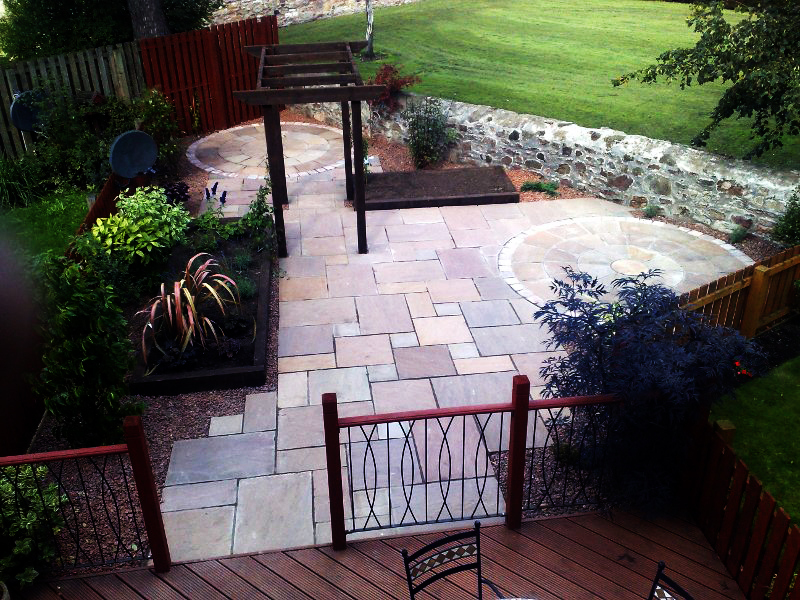 Landscape Gardeners Edinburgh- The Garden Construction Company are based in Edinburgh and provide landscaping services throughout the Lothians, Fife, Perthshire, the Borders and the Central Belt. 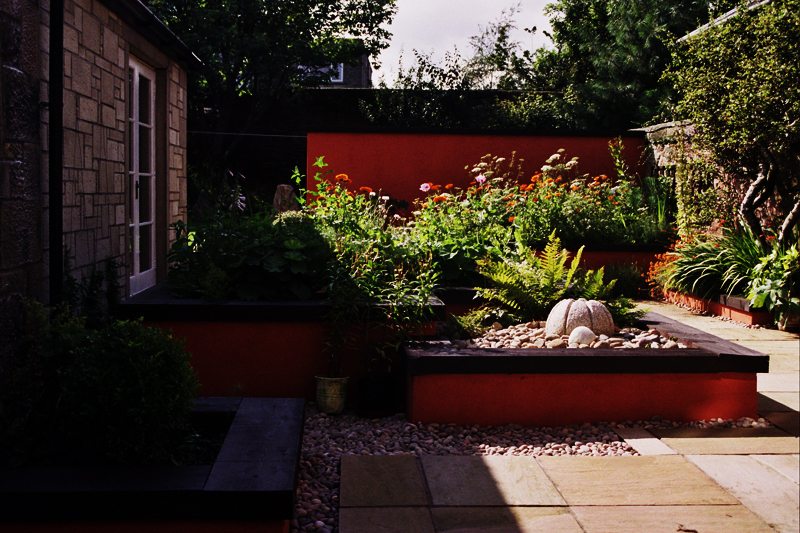 The Garden Construction Co is lead by David Staniforth – who alone has over 25 years experience working on a wide variety of Garden Projects. Each one unique and collectively some of the finest Private Gardens in Southern Scotland.Have a look at more examples of our work at our blog. Whether you need a new Driveway or Paving, Fencing or Decking – require a bespoke Urban Garden Design that is Contemporary and Stylish – or, perhaps, would like a new Water Feature – then we are the Landscapers for you. Contact David on 07958995739 for a free consultation and quote. Hardwood timber decking with water feature to front and associated landscaping to Edinburgh Garden , Polwarth. Whatever you have in mind, we can help you to turn your outside space into a valuable Garden you will cherish for years to come. Size is never an issue for the Garden Construction Company. Whether your ideas are humble or grand we have years of experience working in all the key Landscaping areas. 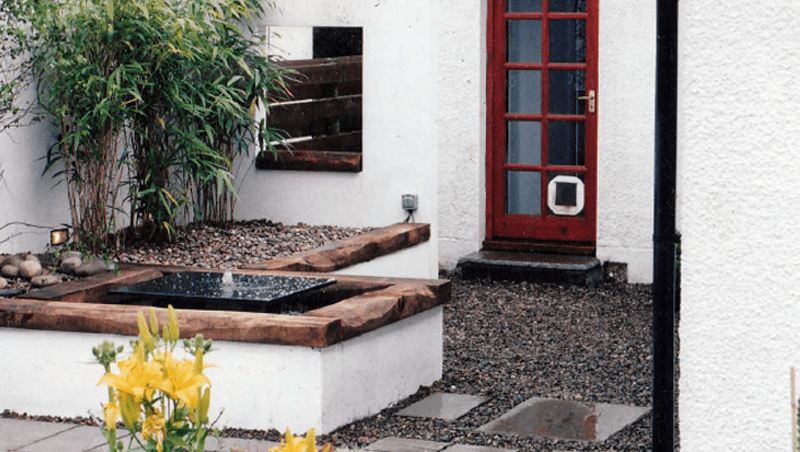 Raised Beds with timber copings with bubble pond to centre , sandstone patio to garden for Victorian house in the Grange, Edinburgh. The range of time-served skills and workmanship at the Garden Construction Company we can bring will ensure your ideas become an economical and timely reality. 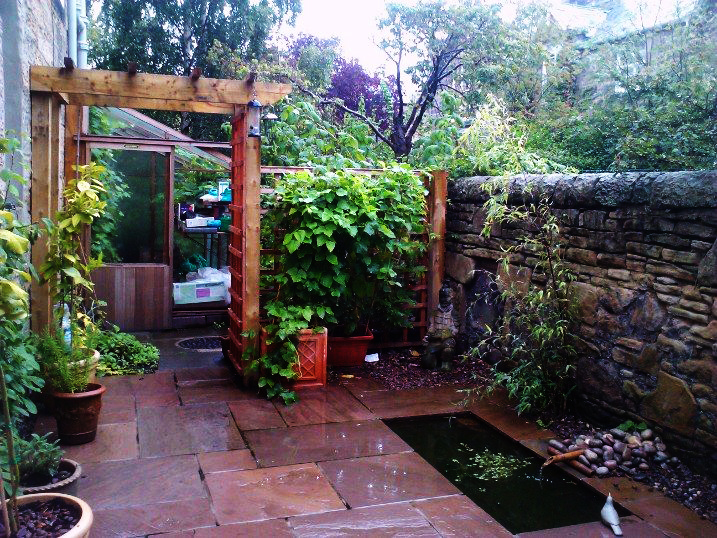 Sandstone patio with water feature and pergola to garden in Sciennes , Edinburgh. We have been around long enough to have the ideas and creativity needed to design and build a garden that suits your requirements and budget exactly. Decking and balustrade to foreground with stone patio and circular patio inlays, pergola to centre and raised sleeper beds with architectural planting, sambuca nigra to right front, phormium jester to left , wisteria to pergola, viburnum tinus to rear amongst others to give stucture to Edinburgh Garden. The Garden Construction Company operate primarily in the domestic Landscaping market but also carries out commercial contracts and are open to enquiries in the market. 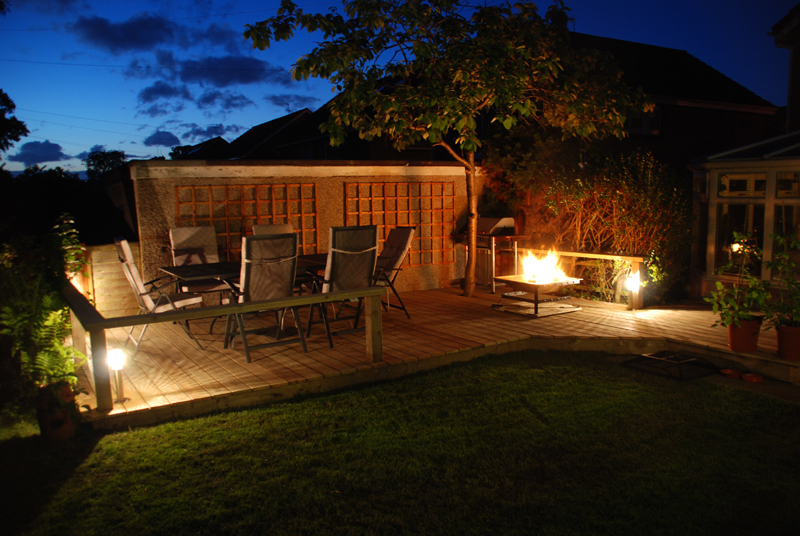 We also specialise in Garden Decking installation and offer a bespoke service with a range of quality hardwoods and softwoods with matching balustrading that will compliment your house and garden perfectly. If you are simply looking for some gardening work or garden maintenance, borders tidied and shrubs trimmed we can provide this service for you. Perhaps you would like a planting scheme for a new border or your herbaceous borders replenished and revitalised. We can supply and install the planting to your garden at an affordable and realistic price whilst achieving the look you want. 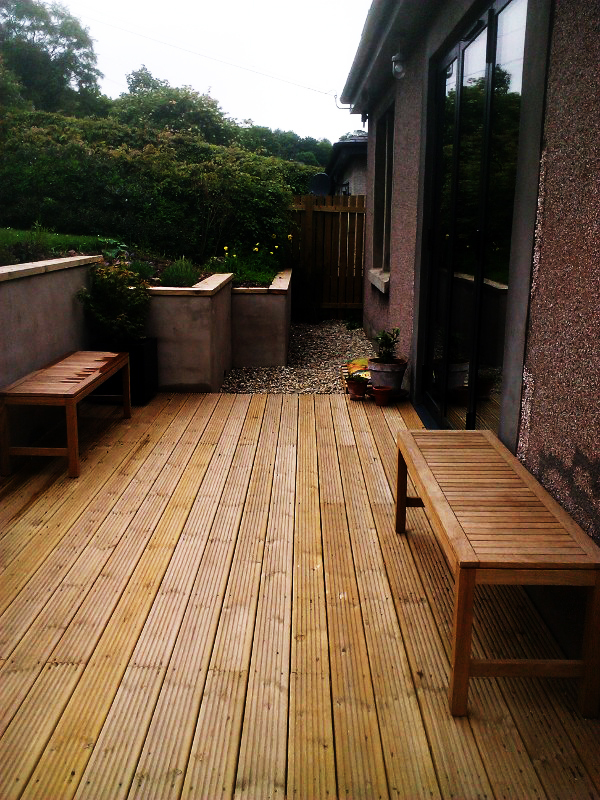 Timber Decking to patio doors with rendered walls and timber copings to bungalow by Holyrood Park, Edinburgh. So if you are looking to get garden fencing or need a new driveway, to have a new patio layed, a garden designed and installed, a new tranquil water feature or perhaps an arbour or pergola then The Garden Construction Co, can help with all your requirements.